My #otspsecretsister bought me this book as one of my gifts. I read it right away, but it has taken me FOREVER to review. I read it on the plane to and from my vacation to Cancun. I love Sherlock Holmes, I watch all of the shows and movies of late, and recently read Warlock Holmes. 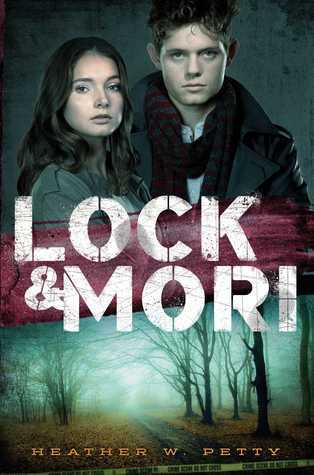 Lock and Mori is a really interesting book. It is about Sherlock and Moriarty as modern day high school students. Moriarty is James Moriarty, a girl! !, who goes by Mori. She meets Sherlock, who she dubs Lock. He challenges her to solve a string of murders with him, the only rule is they have to share all of their information with each other. Sherlock is exactly how you would imagine high school Sherlock to be, observant and odd. It’s so cute how he starts falling for Mori! Swoon! It’s not hard to solve the case and figure out who the killer is from an early point in the book. Despite this, the book is very interesting, and it’s cool to see how everything tied together. I’m excited to read the next book in the series. I love how this book is told from Mori’s POV. It tells all about her home life, with a drunk and abusive police officer father (her mom died.) The entire book is dark with the growing relationship between Lock and Mori being the only bright spot in an otherwise very dark tale. Ohhhhhhhhhhhhhhh and normally I loathe Mycroft in all of the portrayals I have seen him in, but I found him to be delightful in this book! Watson was also in the book, but only briefly, so I expect to see them both in future installments. I am concerned for the couple because they are mortal enemies in the other Sherlock Holmes renditions I have seen. I don’t want to see Sherlock get crushed by Mori, but I do anticipate that to happen eventually. Thanks! Worth a check out! I am a huge Holmes fan. When I was very young, I was introduced to him through the old Basil Rathbone movies. I then read every Doyle story. I have seen almost every tv/film adaptation and read a lot of the literary offerings. I always enjoy every adaptation. I usually do not go for dark and grim stories, but I am tempted to give this one a go. P.S. I have my own Sherlock story. Yes, check it out! Warlock Holmes was also worth a read!! I didn’t know you were a published author!!! I’m going to look at your book now!